There is a street in London where Mayor Johnson is the second most famous Boris. 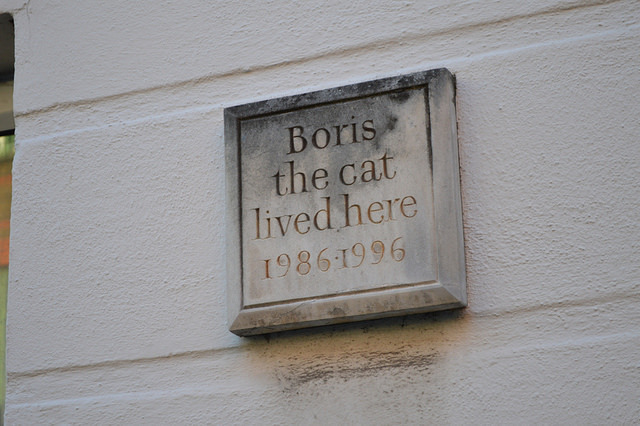 The simple feline memorial (above) graces the walls of 24 Anglers Lane, Kentish Town. That same lane gets its name from the River Fleet, which once flowed alongside. You can still see that watercourse, otherwise buried, in a rusting pipe that spans the tracks near Hampstead Heath. These are just two of the 31 oddities compiled in Curious Kentish Town by journalists Martin Plaut and Andrew Whitehead. The pair know their beat well, giving detailed backstories that go beyond the 'look it up in online forums' research that is evident in so many 'quirky London' guidebooks. Stretching as far south as Mornington Crescent, and north almost to Archway, there's a certain amount of scope creep beyond the book's title. This geographic naughtiness allows for inclusion of gems like the smiling sun graffiti from the mid-70s and the Ready Money drinking fountain in Regent's Park. The plaque to Willie Rushton should be featured in any book about London. We're willing to bet that the typical Kentish Town resident will only be aware of a handful of these overlooked specimens. If you're not familiar with the area, you could spend a very rewarding day following the map at the front of the book and perhaps stopping off in some of Kentish Town's peerless collection of pubs along the way. 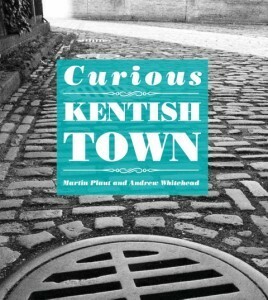 Curious Kentish Town is out now from Five Leaves Publications, priced £7.95. Want more recommendations for London books? See our archive of recent reviews.